In contrast, his son Mercer Ellington wrote a memoir of his father that painted a much different picture of his life. Perhaps tainted by his experience of not seeing much of his father, Mercer summarizes some of the moments when Ellington was sidelined because of his race, such as when Ellington wrote Black, Beige, and Tan as a parallel and critique to African American history and received a patronizing response from critics or the many moments that Ellington had to prove his bands’ worth in comparison and competition with white jazz bands. Perhaps the fact that Ellington left out the more bleak and tough moments of his life shows his view on protesting racial issues. Mercer quotes his father, “’I think a statement of social protest in the theater should be made without saying it.’” His piece, Black Beige and Tan, and his 1963 cover of Gershwin’s Rhapsody in Blue have undertones of critique on white appropriation of jazz by the virtuosity, styles, and stories that he implements, but they have to be inferred. Arguably, these conflicting accounts also show Ellington contributing to the white narrative of jazz. Ellington’s success was not only because of his talent as a musician and bandleader, but he did not outwardly fight the racist structures controlling his profession. Since his autobiography was published at a time when Ellington was celebrated by white audiences as a successful American jazz musicians, it makes sense that he chose to leave his African American experience out. Edward Kennedy Ellington, Music is my Mistress, (New York: Doubleday & Company, Inc, 1973), 436. Eileen Southern, “Reviewed Work: Music is My Mistress,” The Black Perspective in Music, 2, no. 2 (1974): 211-212. 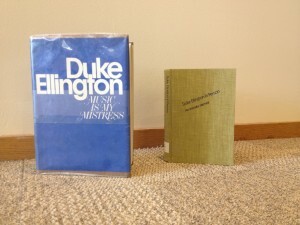 Mercer Ellington, Duke Ellington in Person: An Intimate Memoir, (Boston: Hougton Mifflin Company, 1978), 94.